Slimline dimensions make this cassette suitable for the most demanding installations where ceiling height restrictions apply. Easy maintenance: access to the corner pockets is easy and enables convenient installation and adjustment for perfect ceiling fitting. The depth of the panel is less than 30 mm making sleek and unobtrusive in any architectural condition. The TCC Link control panel makes the control of the system both flexible and easy for maintenance and servicing. The compact four-way cassette has been designed to suit all standard 600 × 600 mm grid ceilings, to allow simple and easy installation maintenance. Its sophisticated design fits with any room interior, where appearance is as important as functionality. 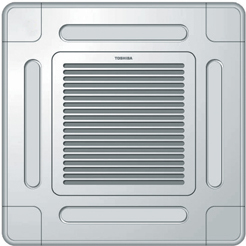 Draft prevention and clean ceiling functions make this unit ideal for the most demanding of applications.